Guest inSights is a FREE new system that has been incorporated into the Night Express PMS. The scope of Guest inSights is to enable guest houses, lodges etc. to collect guest’s review comments and sentiments about the business and analyze them. Being informed of the guest’s sentiments and experience is paramount to identify business problems and weaknesses. This enables one to react, repair any damage and make informed decisions. It eliminates the need for uploading the same information to a costly third party for your analysis. This method is also disconnected from your business. With Guest insights you have constant access to your data directly. As a result you can extract just about any data analytics required. Guest inSights will save you thousands per annum. Try it today, it is FREE. Guest inSights explores the “Dark Data” of the business. With accurate data analytics you can easily visualize important key business indicators such as, Overall Satisfaction, Value for Money, Net Promoter Score and more. Guests inSights helps you to analyse your Guest’s Experience, through which you can determine your CUSTOMERS SUCCESS. Knowing your CUSTOMERS SUCCESS is imperative for managing the relationship between your business and your guests. Guests InSight gives you a clear view on how your guests rate you and your services on different benchmarks. Track your business performance at a granular level. Such knowledge is vital for business growth and reputation management. Guests inSights presents the BIG PICTURE of your guest’s opinions and exposes how they will impact your business in the long term.These facts cannot be ignored for sustainable growth and competitiveness. The days of “selling accommodation” and simple “check-in” “check-out” are over. Providing a good service is subjective and matters more if your guests are of the same opinion. Guests inSights exposes these opinions! With the Guests inSights Dashboard all guests’s feedback can be visually viewed. Why do Guests inSights matter? A simple answer is that no business has enough customers. Therefore your guest’s relationship retention and optimization is essential. An effective way is to make them as successful as possible in using your establishment. Compare rating and review performance for any range of booking periods. Track changes in performance patterns, such as dips and spikes, which negatively affect the business. Drill down to bookings, invoices, rooms, duty staff or any data source as required. Guest inSights enables you to easily identify all negative and other guest sentiments. By drilling down to the source you can easily ascertain the value of the guest’s business and tailor your responses to your guest’s appropriately. Being well informed is being well armed. 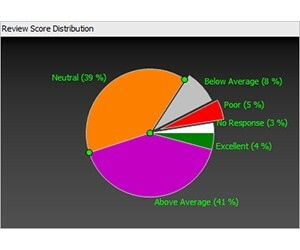 The review score distribution chart shows your performance on a scale from 1 (poor) to 5 (excellent) at a glance. This information is available within seconds. Knowing this facts provides you the direction for your strategic focus in order to improve your CUSTOMER SUCCESS. As an example, if a clear indication of a comparatively low excellent score is shown in the chart, it requires investigation. A strategy for a long-term improvement should be devised to improve this. Guest inSights analysis has built-in intelligence to suggest corrective steps to consider.